If you are running GNP3 on Windows 8, you may have noticed that the old method of installing and configuring a loopback device does not work the same as it used to. 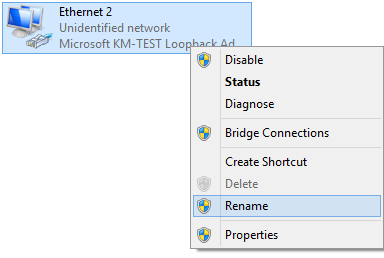 "unable to create generic ethernet NIO"
Type: "hdwwiz" and click "OK"
This will launch the "Add Hardware Wizard"
Select "Microsoft" in the left hand pane, and select "Microsoft KM-TEST Loopback Adapter" in the right hand pane. Once you have rebooted, open your network connections. I changed the name to GNS Loopback. You may call it whatever you like. Assign an IP Address to the card. I use a local private address as follows, The gateway is the IP that I will later assign to an emulated Cisco device. It makes sense for my purposes, but your needs may be different. You can now open GNS3 and add a Cloud Interface. In the cloud configuration screen, add the loopback adapter and click apply. you can now connect to the cloud interface from a Cisco emulated router. I've been using the method you're describing in Windows 8 without incident for almost a year until recently... After having reset my PC back to factory default due to it being "laggy," I've now lost the ability to have my loopback adapters I create communicate with GNS3. Are you not experiencing "any" problems at all using Windows 8 with your loopback adapters? For me this works perfectly, I have had no issues with it.